The goodies keep on coming! Here is a GREAT and simple gift to pop into every stocking this season - or to pick up and use through the winter when you're going to get chapped lips and want to pick up your day with a little something different! This season, ChapStick® has NEW Mixstix - Vanilla Candy Cane Milkshake, which is a 2-sided lip balm that hosts a different flavor each end, which you can wear on their own or mix it up for a 3rd, unique flavor - Vanilla one end, Candy Cane the other and Vanilla/Candy Cane for the days you just don't want to have to choose between the two!! You can purchase these mixstix from ChapStick® at Walgreens and CVS exclusively and wil set you back about $1.99-$2.69 OR you could buy a double pack for just under $4 at Target! - Perfect for gifting or stocking up on!! ChapStick® doesn't stop there, either! There are a couple of seasonal varieties this year that I know you are going to LOVE! For just a little cash (between $1 and $1.99) you will be able to pick up a 1-count supply of Pumpkin Pie or Candy Cane ChapStick® at Walmart and Walgreens all season, or a 3-count pack at Target and CVS for around $2.99! I haven't had a chance to try out the Pumpkin Pie ChapStick® for myself, but anyone who knows me knows that I ADORE pumpkin everything and so this is right up my alley! 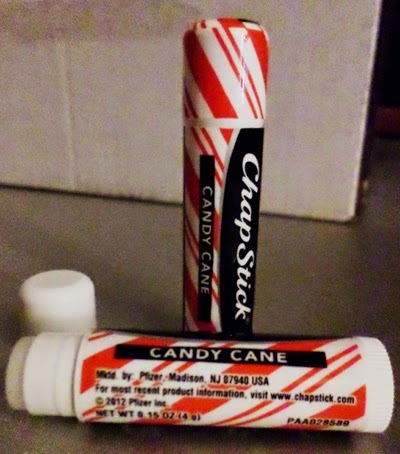 I did, however, get to try the Candy Cane ChapStick® variety and I LOVE it! It is sweet smelling and soft in application and makes everything smell like Christmas - I highly recommend them as a great little stocking stuffer for friends and family or to load up on for yourself before they are all gone!! As a bonus, this season you can also pick up a ChapStick® festive Holiday Tin, which contains 2 Candy Cane ChapStick® tubes! This pop-top Holiday Tin is available at Walgreens for a limited time starting November 1st, through the Holiday Season for around $3.49! To find out more, you can visit the ChapStick® Facebook page and Website for exciting news and flavors! Disclosure: “The ChapStick® product, information and gift have been provided by Pfizer Consumer Healthcare.” - all opinions are my own. I love Chapstick! I haven't tried this one yet. I can't wait to go shopping next so I can grab this one. Thanks! I agree, this would make great Christmas Stocking stuffer. I am in love with the candy cane flavor this year! Its love on my lips! I always love it when Chap Stick puts out their holiday flavors, but I don't think I've ever seen a Mixstick before! Totally looking for these when i run to the store later.